For those who were wondering, this is what a ground looks like after a team that dropped out of the league for a few years has returned to League 2. 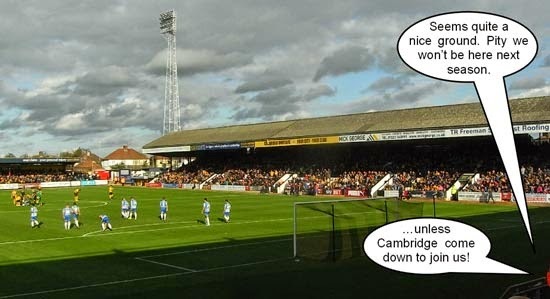 Actually not much different, as Cambridge's Abbey Stadium shows. Andy Wilson has told us about something that he's organising with the help of Phil Dunn for next May. That may sound a bit far off but we think it will be a very popular event so don't leave it too long if you're interested. 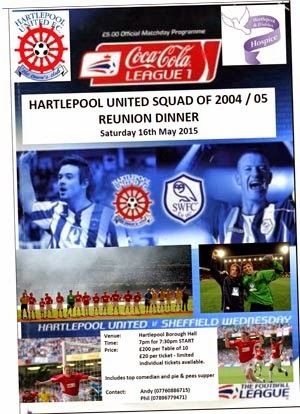 It is a Reunion evening with the Hartlepool United Squad of 2004/05, the year we all had a wonderful day out at Cardiff. The event will be held at the Borough Hall, on the Headland, on Saturday 16th May 2015. Tickets are only £200 for a table of ten, with a couple of tables that will accommodate smaller numbers if you only require 2, 4, 5, or any number smaller than 10. Players and staff confirmed to date include; Micky Barron, Dimi, John Brackstone, Adam Boyd, Neale Cooper, Darren Craddock, Jon Daly, Mark Tinkler, Chris Westwood, Antony Sweeney, Matty Robson and many more.